With 134 fresh, inviting and generously sized rooms ranging from modern hotel rooms to super-size suites with galley kitchenettes, Swiss-Belhotel Brisbane offers exactly what you need to relax and enjoy your stay. Choose a River View Room to see the beautiful city lights while looking over Brisbane River towards South Bank or across the Kangaroo Point cliffs to Brisbane City. If you’re looking for a hotel in South Brisbane with a gym and an indoor heated pool then Swiss-Belhotel Brisbane is ideal for you. The gym is fitted with the latest Technogym equipment while the pool is open from 6am to 9pm and is 9m length x 3.4m width with 1.3m in depth. Towels are provided. Booking direct brings a host of benefits, discounts and other special offers. Whether it be savings on extended stays, weekend and holiday packages, early-bird booking options, or simply a getaway for you and the family, Swiss-Belhotel Brisbane has you covered. 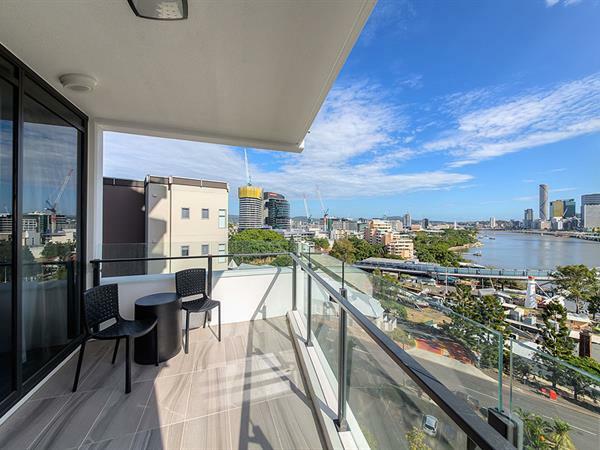 Check out our South Bank Brisbane accommodation specials here. Enjoy a relaxed stroll through South Bank Parklands and a dip in the South Bank lagoon pool or head over The Goodwill Bridge pedestrian and cycleway to Brisbane CBD. Within easy walking distance are Brisbane Convention and Exhibition Centre, The Gabba Brisbane Cricket Ground, Queensland Performing Arts Centre (QPAC), Gallery of Modern Art (GoMA), and Queensland Museum. 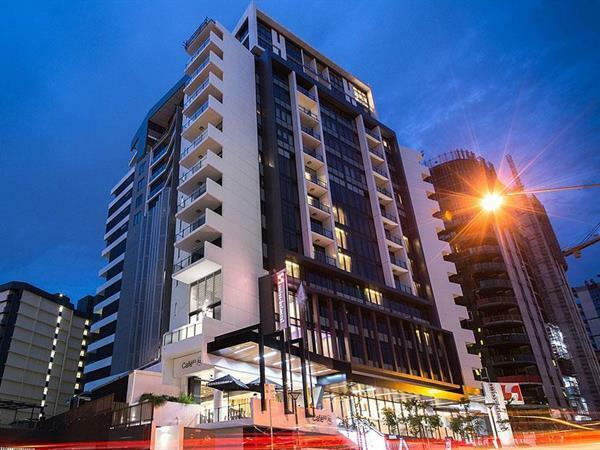 The hotel’s South Brisbane location offers accommodation near Lady Cilento Hospital Brisbane, Ronald McDonald House and also Mater Hospital Brisbane, not to mention close proximity to South Bank train station. If you need easy access to some of Brisbane’s best Universities and educational institutes then look no further. Swiss-Belhotel Brisbane is near to the University of Queensland (UQ), Griffith University, Queensland University of Technology, Shaftston College, Australian Catholic University, TAFE Queensland Skills Tech, Southbank Insitute of Technology, Griffith Film School and also Central Queensland University. Swiss-Belhotel Brisbane’s Café 63 serves breakfast, lunch and dinner seven days a week and offers in-room dining for hotel guests. It’s one of Brisbane’s most popular cafes with authentic Australian style cuisine, great coffee, and fresh, locally sourced produce. Guests often comment on Swiss-Belhotel Brisbane’s great customer service, ideal South Brisbane location and modern, comfortable, well-appointed rooms. Our great food and on-site café with ‘very good takeaway coffee’ are also mentioned often by guests. Read recent reviews here. Our fresh and bright events space features high ceilings, natural light, free Wi-Fi, an outside area with views over River Terrace, Brisbane River and South Bank Parklands. The space can be opened up as one large room catering for up to 90 guests or split into two smaller spaces and used as breakout or meetings rooms. Read more. Take advantage of our large variety of packages and special offers created by us and designed with your needs in mind. Whether it be savings on extended stays, weekend and holiday packages, early bird booking options, or simply just a getaway for you and the family, we have you covered. Check out great special offers below. Stay in touch with all the latest news about Swiss-Belhotel Brisbane. The hotel offers 134 spacious, beautifully designed rooms that span from level 1-7 including Superior Rooms and Superior Rooms with River Views. Café63 provides the ultimate coffee experience along with delicious lunches and dinners. The hotel features a gymnasium with the latest equipment from Technogym as well as an indoor heated pool. Our pool is open from 6am to 9pm and is 9m length x 3.4m width with 1.3m in depth. Towels are provided. Relax on the pool chairs or over the terrace overlooking Southbank River. Swiss-Belhotel Brisbane is located to many of Brisbane's top attractions including The Wheel of Brisbane, South Bank Parklands, Gallery of Modern Art and much more.